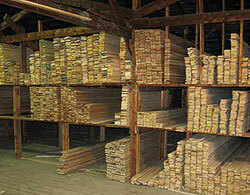 The A. Johnson Co., LLC produces lumber for both wholesale sales and retail sales. We have strongly supported the SFI program for sustainable timber harvesting for many years, believing that certification is important to the long-term viability of the forest products industry. See our forestry page for more information about and links to the various programs promoting sustainability. All timber harvested off company lands or under the supervision of a company forester is first party SFI certified. Available in widths of 3, 4, 5, 6, 8, 10 and 12 inches. Beaded Pine & Basswood profile, Tongue & Groove with a bead on the edge and center of the board; a wainscotting tradition. 4" has no center bead. 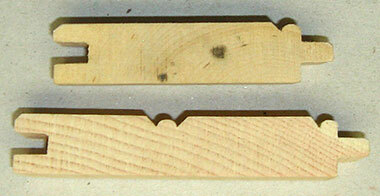 V-joint Pine & Basswood profile, Tongue & Groove. Most often used as paneling. 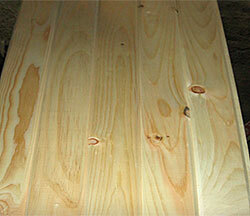 Pine flooring available in 5, 6, 8, 10 & 12 inch widths. Hardwood flooring available in 3, 4, 5, & 6 inch widths. Hardwood Flooring, Tongue & Groove with a recessed back. 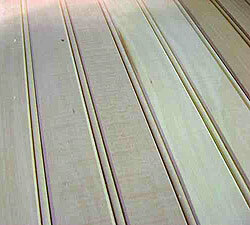 Flooring & Paneling: is sold random length. Material will expand and contract in your home with changes in humidity and heating - especially between summer and winter. Cracks between boards may appear and disappear. Wide boards will move more than narrow boards. To reduce this effect, acclimate the material. Store it in your house piled on stickers or lath so the air can circulate with the heat on for a few weeks prior to installation. Custom Planing, SL Ripping & Trimming: We can usually surface 2 sides and/or straight-line rip 1 side small quantities of our lumber while you wait. 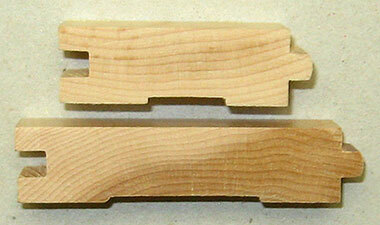 A small amount of defects (splits, cracks) are normally caused by planing. Please allow for this loss in calculating your purchase amount, as we will not replace these boards. Hardwood species are available both wholesale and retail. Softwood species are generally only available through retail sales, except for box grade white pine, which is available in wholesale quantities starting in the late spring of each year.